The items of interest were discovered in an area deemed “site 1,” which is closest of the three digging locations to the dorm where Smart was living at the time of her disappearance. Sheriff’s detective commander Aaron Nix said it is too premature to say whether the items of interest are really intriguing or whether they just require a closer look. When investigators find items of interest, they will use brushes and trowels to gather them, much like workers do during an archeological dig, sheriff’s officials said. Items discovered that may call for a second look will be sent to the FBI’s forensic anthropologist in Quantico, Virginia or to a local state laboratory. 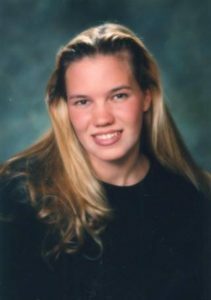 Smart, a native of Stockton, was nearing the end of her freshman year at Cal Poly when she vanished on May 25, 1996 after attending an off-campus party. The 19-year-old was last seen in the company of fellow student Paul Flores who claims he escorted Smart to her dorm, which was relatively empty due to Memorial Day weekend. The sheriff’s office recently learned that Smart’s remains may be buried on a Cal Poly hillside. The FBI then brought in cadaver dogs which alerted detectives to several locations below the Cal Poly “P” landmark. This week, authorities set up a command post that is being manned by 25 FBI agents and 15 members of the sheriff’s office, as well as California Department of Fish and Wildlife investigators. Preparation work for the dig began on Tuesday, and digging started on Wednesday. Sheriff’s officials confirmed Thursday morning that they had found the items of interest. Sheriff Ian Parkinson has said a lead strongly suggested Smart’s remains may be buried on the hillside. But, Parkinson also said there are other areas of interest in the case. Flores, who dropped out of Cal Poly after Smart’s disappearance, was the initial focus of a police investigation. He is believed to now be living in Southern California. Flores remains a person of interest, according to the sheriff’s office. Smart’s parents, Denise and Stan Smart of Stockton, filed a civil wrongful death case against Flores in 2005, but they dropped the case after Flores pleaded the Fifth Amendment in court. Flores has been arrested for DUI three times since 1997 and was sentenced to 240 days in jail for violating his probation after the last DUI. The excavation of the Cal Poly hillside is expected to conclude Friday. While the media focuses in on the Cal Poly location has anyone taken the time to drive by Flores’s mom’s old house in Arroyo Grande to see if anything is going on there as well? We have sunk so far as a Nation, that the FBI is charging SLO taxpayers for their involvement in this new stage of the investigation. A substantial delay in digging was caused by demanding payment before work could proceed. Add in multiple Agencies jockeying for input and credit- you get bureaucratic delays that have prolonged the Smart family’s agony. “There is rarely Justice, but usually Resolution”. Paul is already living in a Prison, of his own making. May he never find an early release from it. The items of interest were discovered in an area deemed “site 1,” which is closest of the three digging locations to the dorm where Smart was living at the time of her disappearance. What the? What does this mean? Either a skeleton was recovered or not. What other items of interest could there possibly be? This was a college campus murder. The murderer either took her here and buried her or took her somewhere else. If he took her somewhere else, why would there be items of interest here? It appears the sheriffs constant preening and desire for public affirmation is driving this facet of the investigation more than actual careful, deliberative investigative procedures. The items of interest might be something a detective would want to hold back from public knowledge for use during a suspect interview, so why say anything at all? I do hope they find her at this location so that the Smart family can have some closure. We had well-intentioned friends who “threatened” for years to come visit. We’d make preparations but ALWAYS a day or two prior to their anticipated arrival, a family member would get sick and they’d cancel. It became such a pattern that we wished they would not tell us—just show up! On a similar note, it seems like it would be wiser for the Sheriff not to even mention finding items of interest at Poly. It just gets everyone, including family, revved up for, perhaps, nothing significant. Better to wait until the analyses are complete. Then, if there is something verifiably pertinent to Kristin’s demise, PLEASE TELL US! Anything else is just teasing. Each and every day I hope you die for your cowardly act of violence that ended Kristin’s life.